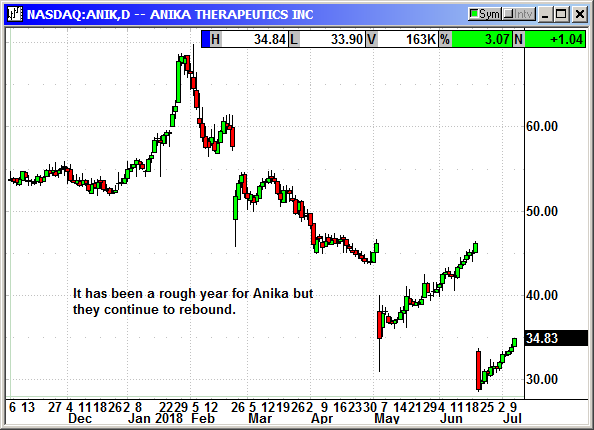 The lack of suppressive tariff headlines allowed the market to break out of its depression. 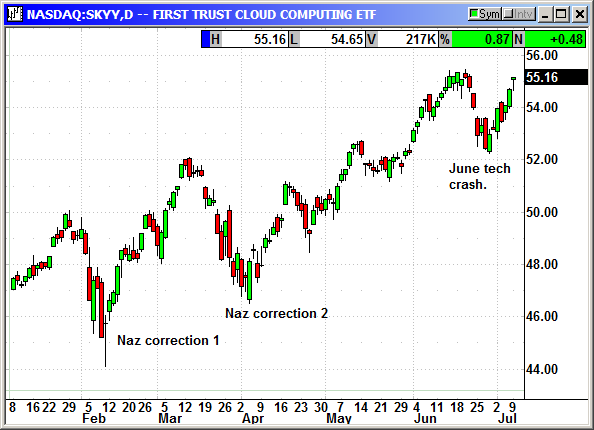 The Nasdaq posted another outstanding gain of 68 points and closed within 15 points of a new high. 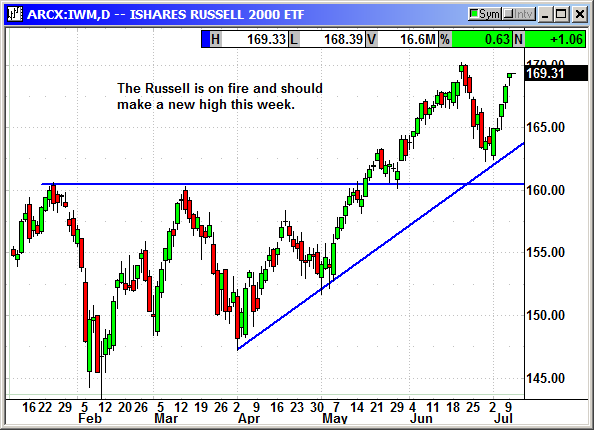 The Russell 2000 added 10 points and closed within 2 points of a new high. 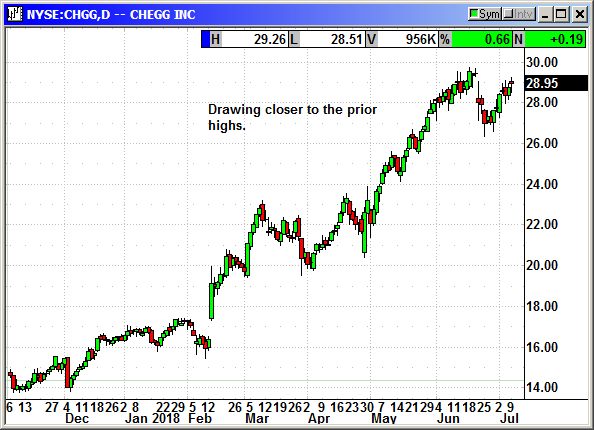 With any kind of luck at all we should be poised for some new highs on Tuesday. The lack of any material headlines on Chinese tariffs allowed the market to focus on the earnings upgrades and the approaching Q2 cycle. There was actually a series of comments making the rounds that the tariff dispute, rather than a trade war, would actually keep the Fed on hold and restrain the number of potential rate hiked this year. Conventional wisdom is expecting two additional hikes but there is a growing number of analysts that feel we may only get one hike. The Fed has no reason to rush the process. Inflation and wage growth remains stagnant and the Fed can use the next 6-9 months to unload some more QE treasuries instead. They are actually running behind their announced sales goals. I believe the president held off on the Chinese tariff headlines because of the Supreme Court pick process. He did not want to step on his own nomination by crowding it out of the news with a tariff war. He is leaving for Europe tomorrow and there will be plenty of time to stir up the tariff troubles again when he gets back next weekend. This means we could actually have a week with a normal market. 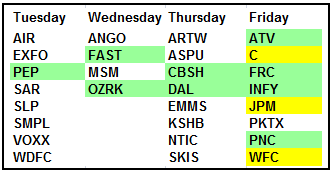 With Q2 earnings kicking off on Friday with the big banks, there is plenty for investors to do over the next couple of weeks. We could actually be setting up for an old-fashioned earnings run. 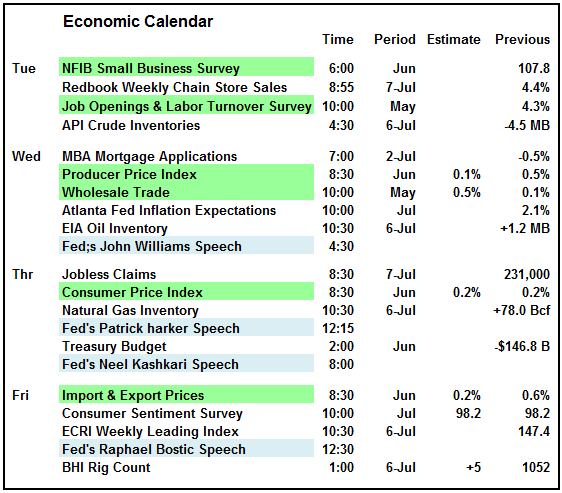 The economic calendar is highlighted by the price indexes and their inflation indicators. This will go a long way towards setting expectations for the Fed. 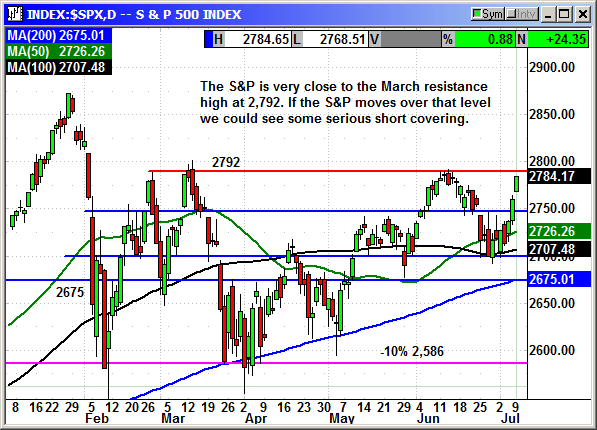 The S&P broke through resistance at 2,742 on Friday and added another 24 points today. That brings it very close to the March closing high at 2,792. If the S&P breaks over that level, we could see some serious short covering and price chasing. The future risk is a potential double top at the January record high at 2,873. 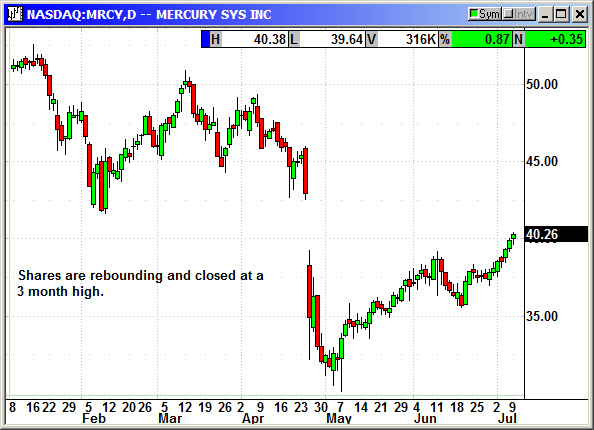 That is 100 points from today's close and about all we can expect from an earnings run ahead of the summer doldrums. August and September are the two worst months of the year and that is when the tariff battle could be heating up. Surprise, surprise! 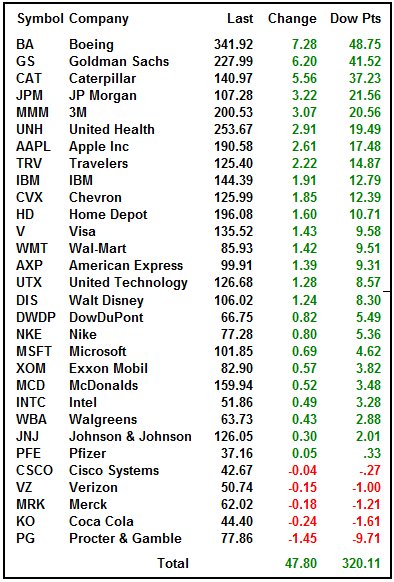 Look who is on the top of the Dow leaders list when there are no tariff headlines. Boeing, Caterpillar and 3M. 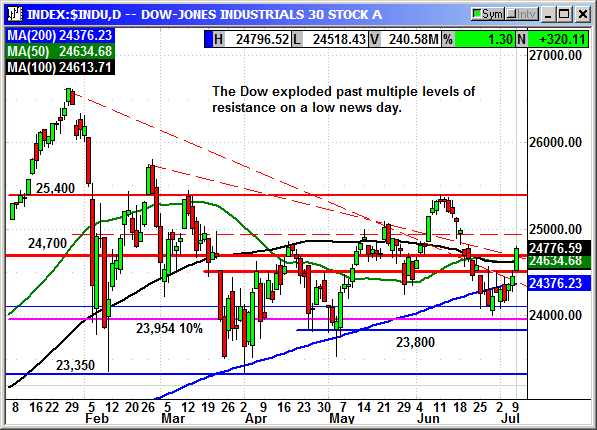 Add in a couple banks on a change in Fed expectations and suddenly we have a 300+ point Dow day. The Dow is still the lagging index and has a long way to go before reaching real resistance at 25,400 but this was a good day. Multiple levels of resistance were broken. 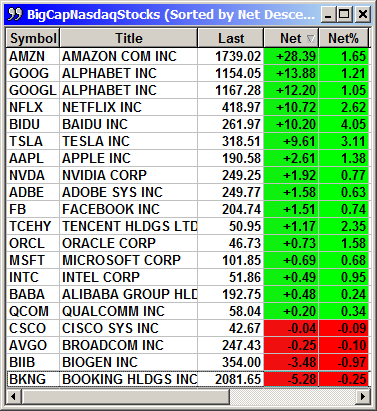 The Nasdaq posted a 100 point gain on Friday and followed with a 68 point gain today. The close at 7,756 is only 25 points below its record high. 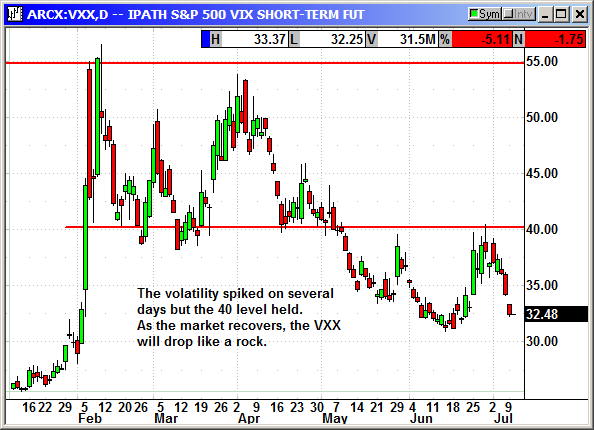 Just one more good day and the short from June will have to start covering again. The big cap tech stocks were rocking with the exception of Bookings Holdings, formerly Priceline. 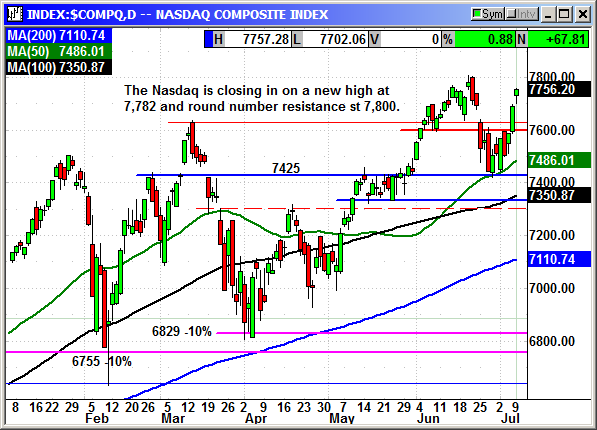 The Nasdaq is facing round number resistance at 7,800 if it does succeed in making the new high at 7,782. 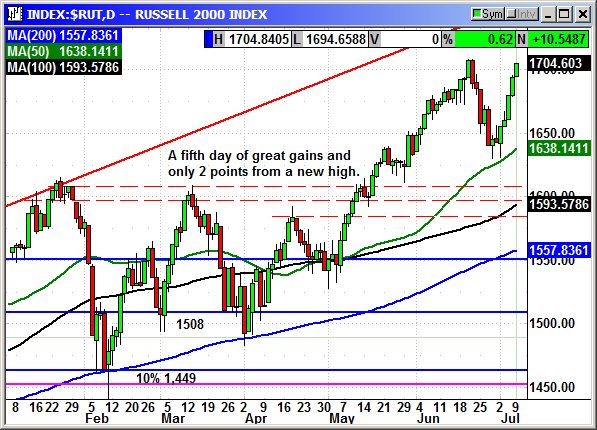 The Russell 2000 has posted five consecutive daily gains and closed only 2 points from a new high. The Russell is racing the Nasdaq higher but it is at risk of a sell the news event on a touch of that high simply because of the string of gains with no pause. I am positive on the markets as long as the tariff headlines to not worsen. The current headline focus is on Q2 earnings and we do not want that to change. If President Trump comes back from Europe and immediately attacks China again, we could lose our gains. However, in his recent tweets he continues to call President Xi a great man and a friend. There may be some behind the scenes negotiations in progress. 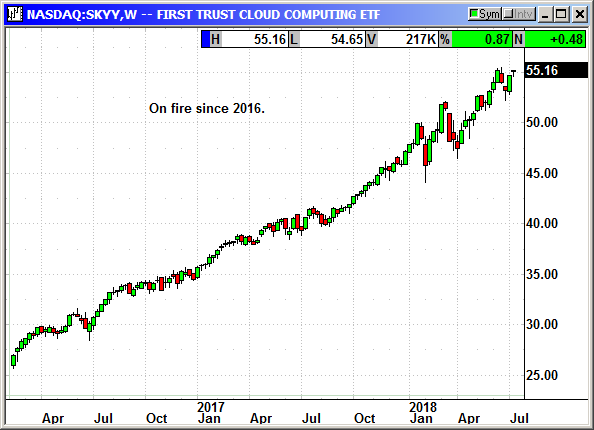 If a headline suddenly appeared that a resolution had been reached, the market could explode higher. Buy October $57 call at $1.25. Limit order. No initial stop loss. No specific news. Shares continuing to rebound. Chegg acquired StudyBlue for $20.8 million in an all cash transaction. There will be no change to 2018 earnings but they will take a $1 charge in 2019 for facility consolidation. The acquisition will add a significant number of subjects to their existing offerings. The new offerings will include online flash cards. In 2016 29% of students used online flashcards. That roies to 37% in 2017 and continues to rise. Fifty percent of students claimed that was their only method of study. No specific news. Small caps are still the strongest sector and could make a new high this week. No specific news. Shares continue to rebound and closed at a 3-month high. The VXX is crashing as the market rebounds. It could make a new five month low this week.